July, August and September. Love these months for many reasons but love them especially because they are FULL of County Fairs!!! Do you participate in yours? I'm not sure what I'd do without them. Participating in them as a volunteer, and exhibitor and promoter are family tradition. I remember attending as a youngster with the grandparents and tagging along with them as they worked booths, contributed entries and enjoyed the many offerings at our local fair. We've expanded over the years to participating at the state level attending, vending and teaching at the state conference and exhibiting at the State Farm show. We've all attended judges school and now get to visit a host of fairs throughout the state judging entries in a variety of areas. It is so thrilling to see the works of so many talented individuals. August was my 50th year of participation. It's taken that long for me to realize that these fairs motivate me. Motivate me to finish projects. To get things done. To use my stash and empty the project bags and FINISH things I have started over the years. 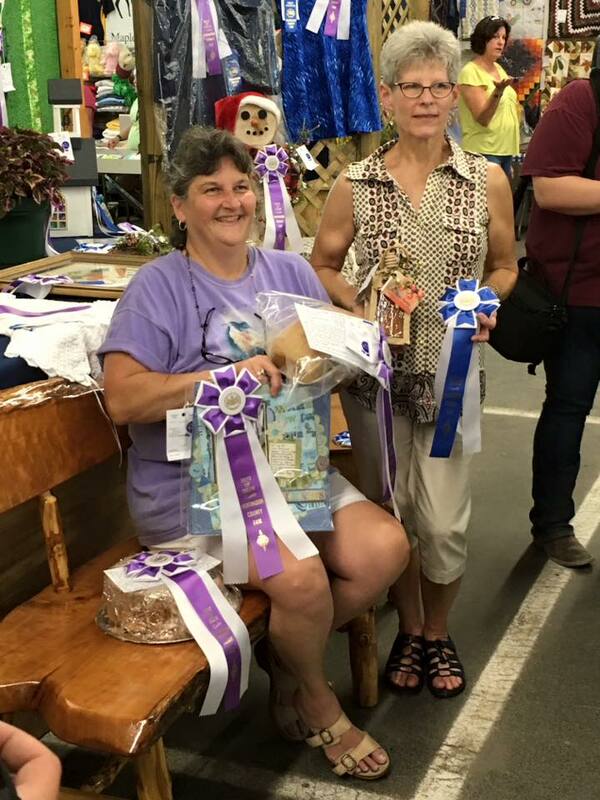 It's also taken 50 years for me to realize that nearly every handmade item I received as a gift from my grandmother and mother had been entered in the fair! How dare they keep this secret from me!!! Although I've been doing it all along...I just didn't know! Sooo...here's to the summer fairs and the completion of projects!!!! What motivates you to finish projects? Scrappin' on the Road with Kiwi Lane!!! One good adventure deserves another!!!! The very first Kiwi Lane monthly Kit club arrived just day before we departed! Perfect time to test my skills at Scrappin' on the Road with my Kiwi Lane!!! Theme for this first kit was Adventure...how convenient for a trip west!!!! After much time spent shuffling between etsy, websites, and other platforms I've returned to the blog! I couldn't be more excited to simplify and downsize from juggling 6 forms of "media" to just 3- the blog, facebook and instagram!!! Stay tuned as I update and get everything in the right place here and get ready to join me on a #wildwestadventure!!! Who knows where I'll turn up stitching or scrapping!!!! This year is the year. No word, no resolutions...just a plan of sorts to "Git 'er Done"! A plan....without a plan (LOL) to cross those "things" off my list. First of these "things" involves a wonderful journal, a calendar and pages to make lists! It's the ultimate in organization for the "planner" in me. I have dreamt for the last few years of getting organized to simplify holiday shopping, grocery shopping and other family events. I am forever thinking of the ideal birthday gift months before the actual birthday. Then...the time comes to shop for the birthday and...do you think I can remember the gift I am to buy? It must be old age, my memory bank flash drive is full. So I had this bright idea...write it down!!! Voila...birthday gift shopping crisis averted. It's simple for sure but it's already making a difference. Love the bright red color and the 9" x 6" size. Fits into my pack and is lightweight to carry too. I love that each month has 2 pages with space to write in each date. The future months down the side is turning out to be a bonus. The "Notes" pages are must haves as well. I have already decided to create my own version of this for 2016. That version may include a few additional "Notes" pages. This particular journal is from the Gallery Leather Company. I am not promoting them...just identifying this journal. It's a perfect fit for my "2015 Plan". A place to Doodle and Dream with some stitching in between....all while waiting for the laundry to dry the old fashioned way. Perfect day by my standards. Hope yours was too! Two posts in ONE week! LOL!!! How is everyone? There's been alot going on here! Random pictures to follow. First let me tell you about a really great event I've been working on. Seems, even though I retired, my Home Economics/Family and Consumer Sciences background is still coming in handy! I'm loving the recent interest in knitting, crocheting, quilting, rug hooking and felting and I have enjoyed being able to add classes to the list of Grove's class offerings. Find out more about the event and register at the website. I'll have a booth in the Vendor Fair. Stop by if you're in the neighborhood or attending Folk College! Grove's storefront will be closed to attend the event Sat. May 25th!